This week, Access All Areas members have a collection of pretty gold confetti backgrounds and overlays to download, courtesy of Alaina Jensen. These 30 PNG files with transparency contain a variety of glitter and foil textures to mix and match as photo overlays and brighten up your compositions. Each one has a unique gold confetti pattern that produces different gold textures, with fine glitter, chunky glitter and gold foil. Also included are 14 JPG files with combinations of each glitter overlay patterns to produce a range of ready made digital papers. Alaina Jensen is a full time digital artist with a passion for texture. She sells glitzy, highly detailed and artsy effects, including her best selling Gold Rush Kits for Photoshop and Illustrator and her brand new Gold Dust Glitter Effects pack, which makes it easy to add glamour and luxury to your layouts. Other products in her diverse portfolio include chalkboard and watercolor effects. 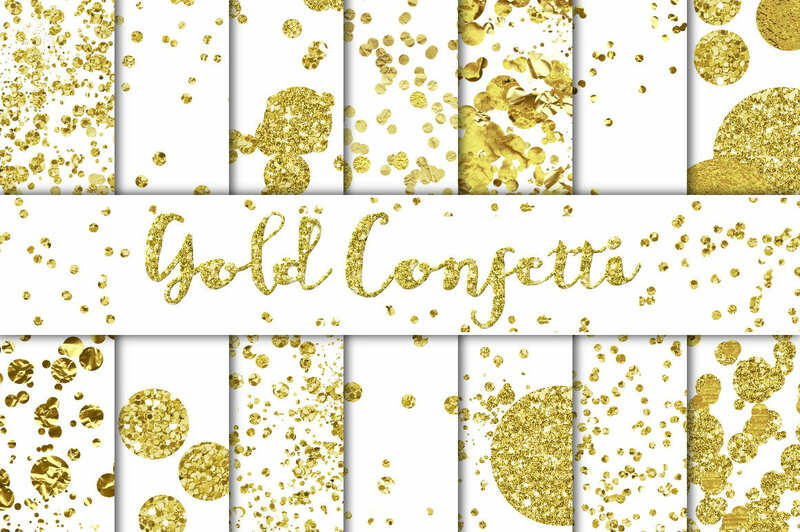 Access All Areas members can download this collection of gold confetti backgrounds and overlays as part of their membership. It contains 30 PNG files with transparent backgrounds of a range of gold glitter and foil patterns, along with 14 ready-made digital papers in JPG format, making these resources compatible with any design and image editing software. Lovely Collection Chris. Will definitely use them in my upcoming designs. How very nice! And, useful! Thanks to Alaina Jensen and to you, Chris! Glad you like them too Su! Glad you like the collection, Barb.